Today is Memorial Day. *Not* Veterans Day. I grew up the daughter of a Marine and the difference was explained to me, very seriously, at an early age when I made the reprehensible (to my dad) mistake of mixing them up: on Veterans Day we celebrate all those who have served. On Memorial Day we remember and honor those who died while serving. As a child, I observed the holiday with my family and was often uncomfortable by my father’s demeanor on that day. He was more solemn than usual, and often quiet and alone in his thoughts and memories of those he had known. I was aware that he knew many marines who had died, some of whom he had led in combat in Vietnam, but I was too young to appreciate the scale of the losses he had endured. It wasn’t until years later, when I was a young officer in the navy, that I could start to understand the responsibility and bond that one must experience to fully comprehend. Over an 18 month period during my first fleet tour, we lost six aviators from my air wing. That’s about 3% of the naval aviators onboard a carrier. We weren’t even in combat, getting shot at. I remember the shock of the mishaps, the realization that someone I had just seen at chow earlier in the day was now dead. Strangely, I never thought twice about not continuing. I loved flying off the carrier and that was my job. The biggest worry I had was that I might somehow screw something up and cost someone else his or her life. Especially as the pilot of a jet with 1 to 3 other people flying along with me, I felt an immense responsibility for their safety. I began to understand my father’s grief. I miss the camaraderie of the ready room and the bond I shared with other active duty servicemembers. It’s odd to realize that I am now one of those civilians we used to complain about…although perhaps because I did serve, I am not in the same league. There is a unique connection that exists among those of us who, at one time in our lives, were ready to give up our lives for the greater good of our county. While we used to joke that we were merely pawns in a game played by politicians and flag officers, we all knew inside that what we did mattered. By serving in the military, we were each contributing in our own way to the preservation of democracy. As a naval aviator, it was easy for me to believe that about my service, but I also felt the same about the contributions of everyone on the aircraft carrier. It didn’t matter if you were steering the ship or scrubbing a salt-water shitter…you were making a difference and it was appreciated. (Funny that since leaving the military, the only other job I’ve had where I’ve felt like I’ve had a similar level of impact is my job as a mom. And just as I can share a smile with a mom who is struggling with a cranky toddler and feel like we both “get it,” I can shake the hand of a veteran and know that we share a unique bond). I wish there was a more impactful way to celebrate Memorial Day. Today, with my children, I will observe a minute of silence and then I will tell them about the friends of mine who died before, during and after our deployment to the Persian Gulf. I want my kids to remember that we are extremely fortunate to live in a country where there are people willing to give up their precious lives to keep us living in a free land. If someone makes the mistake of confusing Veterans Day with Memorial Day and thanks me for my service, I will of course accept the gratitude. 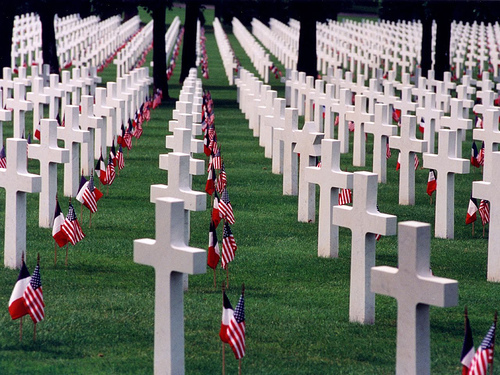 But I will be thinking of my friends who are no longer here, and thanking them for making the ultimate sacrifice.